Since maxis and prints are kind of a weakness of mine, it was an obvious decision to snag the Love Stone Maxi from Beauxx.com. Not only is it gorgeous and perfect for fall but it was on sale for under $60, among many other beauties at the street chic boutique. Of course, while at fashion week this was my first and favorite look, so of course I had to recreate it for you. Ps. Love my Oxblood Lips for BDIB? Another fabulous maxi!! I swear you always have the best ones. Love with the jacket! That bag is so fun and artistic. Your outfits are always so fun and artistic. Snakeskin is a weakness of mine too, and I wish I could get my hands on this too! You look fantastic, oxblood lips included! Obsessing over this look. The skirt, your hair, the lipcolor! It's amazing!! I love that you paired this jacket with the snake dress. It looks very edgy and rocker but still classy. You are a smokeshow!!! Oohhhhh SOOOO HOTTT!!! ROCkin' ROlla! Love that leather jacket and fringe bag!!! KICK ASSSSS! LOVE your skirt! And definitely loving the Oxblood lip! :) So pretty! 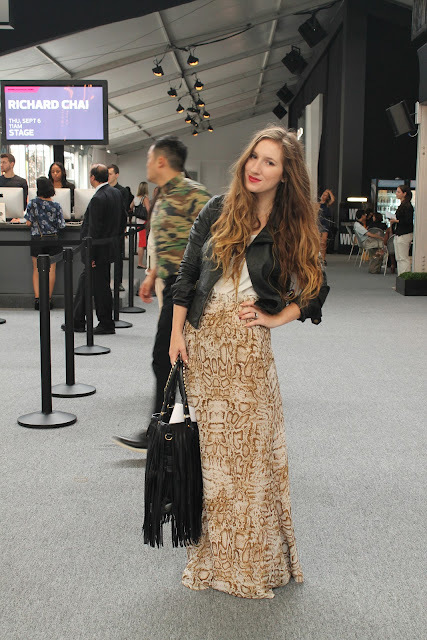 I would never think to purchase a snake skin maxi skirt but you've officially changed my mind! Love this color! Love the print! It's perfect for day or night. This outfit is adorable (love the print!) but I seriously can't stop looking at your hair. So pretty! LOVE the maxi! I have a snake style collab due to go up tomorrow! Oh la la la that snake print maxi is beautiful! I really like how you paired it with leather to give it that tough but very chic look. Amazing look! This maxi is perfect! I finally found the black, pleated maxi I've been looking for for months, but now I'm going to be obsessed with finding one like this. I adore this look! The skirt, the bag, the lips! So pretty and different from everyone else. wow, wow, WOW! Stunning Megan! That first photo.. god, I love it! I am in love with this skirt! It's gorgeous! The skirt looks REALLY great with the leather jacket. LOVE! !